Routine elevates the adventures of No Man's Sky. I’m staring at a series of red symbols, each potentially representing several hours of work. My hyperdrive is broken, my storage space is clogged with sparking components, and I’m fairly sure my landing gear is oozing something dirty at me. I need to mine copper from limited deposits, harvest organic material for valuable carbon, and fuse the copper into Chromatic Metal—all while dodging the watchful eyes of Sentinels. At best, I’ll be hobbled until roughly half of these elements are repaired. At worst, I’m stranded on a planet that, though beautiful, has little of the resources I need. I need to build a base. I need to find a way to establish contact with the trading post at least 30 real-life minutes away, and buy what resources I can’t craft. Hell, I have to learn new words so I can even communicate with the alien beings that inhabit it. Somehow, I couldn’t be happier. ‘Repetition’ can be a dirty word for people who play games. It conjures images of grinding through endless waves of low-level enemies, or trekking through environments you grew tired of long ago to fulfill another basic fetch quest. Yet, several successful games (and even series) have been built around repeated, even mundane routines. Why is this the case? The core concept separating good repetition from an aggravation you tell your friends to struggle through to get to the good bits of a game, is storytelling. What is the narrative that emerges as a result of a player’s repeated actions? Fighting waves of creatures emerging from the sea itself to attack your newfound coastal refuge in Ys VIII: Lacrimosa of DANA is heroic. Even without a goal like getting a high score, both context and experience (i.e. hearing your comrades’ morale increase as a result of your killing a disturbingly large lobster) make these raids feel like a legitimate part of your story. You’re the desperate defenders of a shipwrecked, thrown-together family. Driving along the autobahns of Euro Truck Simulator, you create stories in your head. The truck you’ll own one day, when you work for yourself. The highest, safest speed you can reach along a familiar highway, to beat the bad weather rolling in behind you. Contrast these scenarios with quests in an RPG where, despite being the next savior of mankind, you stand in a graveyard for a few minutes killing any zombies that happen to pop their heads above a crypt. Heroic? Significant? Interesting? Not really. Animal Crossing: New Leaf is a game that understands the difference between good and bad routine acutely. After moving to a new town and being introduced to fun realities like crippling debt for your new house, you’re thrown into a loosely-guided tutorial of things you can do in town. Picking seashells leads to sending letters, to catching bugs, to fishing, to watering flowers. Maybe someone new will come to town, and you want to have a chat. Maybe you want to get deep into expanding and renovating your home—in the eyes of the game, it doesn’t particularly matter. Since Animal Crossing runs on a constant 24-hour cycle regardless of your participation, and those basic actions (fishing, bug catching, etc.) never change, it’s a game you can play for 20 minutes in a day and set aside without guilt. In fact, those 20 minutes a day are the point. You become closer to the world and its people through routine. Interactions are gentle and, sometimes, intentionally clunky. To donate a fossil to the local museum, you have to look for a star-shaped hole in the ground. Then, you dig in the space with a shovel. After, you trek across the map to reach Main Street, and the Museum at its far end. Blathers the Owl, its curator, repeats the same lines he did yesterday and the day before that, before you can finally reach a dialogue menu to get the fossils assessed. After they’re assessed—and only then—can you again reach a menu where you can donate the artifacts, or excuse yourself to sell them for a profit. You have to go through this sequence every single time you want to assess or donate a fossil. Routine can’t be rushed or exploited in the game, as evidenced by the patchy landscaping of a town if a player wears the grass away through frequent sprinting. Yesterday, you fell into a hole while looking for fossils. Today, you avoid the hole and unearth a Pitfall Seed you use to trap a villager you don’t particularly like in their home. Tomorrow, you’ll give a rare bug you collected to a baboon man, and receive a straw hat you try to sell off without feeling guilty. Your narrative is a life lived, with all of the little mundane steps in between that make it feel real. Friction, and occasional misfortune, are a necessary part of this life—much like No Man’s Sky. At first glance, No Man’s Sky and Animal Crossing seem to have radically different philosophies. However, if Animal Crossing is about the joy and journey of routine within a single, static community, No Man's Sky is about the joy and journey of routine within an intergalactic community. In both games, incremental progress occurs within worlds where growing knowledge, maintenance, and increased capabilities for exploration, form an interconnected flow that can't be rushed. You log on, collect necessary materials for upkeep and upgrades, and in the case of No Man’s Sky, maybe learn a few alien words from a glowing monolith on your way to the next series of tasks. To return to my hilariously broken starship, that laundry list of tasks ahead of me is the equivalent of falling into a hole in Animal Crossing—intentional, memorable friction on what would otherwise be a smooth, boring road. In their development updates, Hello Games calls No Man’s Sky players “explorers”. That word choice is significant. 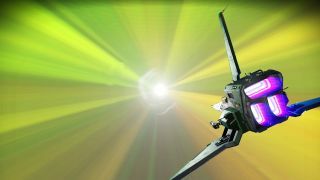 These moments of repetition and routine, misfortunes along the life lived, are what No Man’s Sky’s fluorescent planets, and constant churn of tiny activities serve to evoke. Outstanding adventures don’t just require routine—they demand it.